The Jeff Healey Band’s criminally underrated final album, ‘Get Me Some’, couldn’t measure up to the rest of their catalogue in sales, was poorly promoted and ultimately heralded the end of the Jeff Healey Band… Yet arguably it contained some of their strongest material and performances. 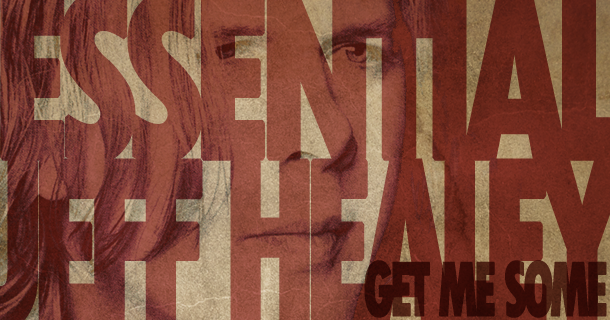 ‘Get Me Some’ was recorded during a time of swirling turmoil in Jeff’s life. His band of 14 years was on the verge of breaking up, his first marriage had splintered and he was relying more and more on drink to see him through (a demon he would eventually overcome in 2002). He had grown increasingly cynical and weary of the business of music. Tired and unsure of what he wanted from his career anymore, Jeff had asked that the band be released from its contract with Arista, only to turn around and pursue a deal with Atlantic shortly thereafter (a deal that the band would ultimately walk away from, masters in hand). Thus setting the stage for 1996. Having wrapped touring for the Grammy nominated ‘Cover To Cover’ album, the band began what ballooned into four years of writing, demoing and recording ultimately some three dozen tunes for the new project (only 13 tracks made the final cut) that would end up being Jeff’s first album of original compositions since 1992’s ‘Feel This’… and his last. The song writing process was not a favourite of Jeff’s. Unlike playing, which was equal parts instinct, structure, improv and flow; song writing too quickly became bogged down in construction and ‘work’. Yet by all accounts, many of the songs on ‘Get Me Some’ seemed to flow effortlessly out of Jeff, certainly more easily than they had in years, perhaps borne by the need to express the frustration and emotion he was dealing with. This seems to be reflected in a recurring theme of loss and endings woven throughout this record. Tracks like ‘Holding On’, ‘I Should Have Told You’, ‘The Damage Is Done’, ‘My Life Story’… even some of the songs written completely by others, like the Dianne Warren penned ‘I Tried’, reflect this. Jeff and bassist Joe Rockman spent much time co-writing primarily with producers, Marti Frederiksen and Arnold Lanni, both adding new depth and a freshness to the proceedings (as well as a number of wonderful performances – both Marti and Jeff even took uncredited turns behind the drum kit!). A sticking point over the years, was the title of the album, ‘Get Me Some’ (taken from a line in the song, ‘Hey, Hey’). Jeff absolutely hated it and was embarrassed by what he saw as the ‘frat boy’ nature of the title –hardly reflecting the maturity of the material within. From the roaring opener, ‘Which One’, to the quiet emotional tribute to his daughter, ‘Rachel’s Song’, ‘Get Me Some’ is a strong record, not without its minor stumbling points (the overly slick ‘I Tried’ for example) yet loaded with absolute gems, like the fantastic ‘Holding On’ (powerful writing and an incredible performance by Jeff) and the moody, grinding ‘Feel Better’ with its great signature riff (courtesy of producer Arnold Lanni) and incredible guitar solo (only slightly dampened by a somewhat stilted Tom Stephen performance on drums). My wife and I went to see The Jeff Healey Band in a club in Scottsdale when they were touring to support “Get Me Some”. What a great show! I bought the cd (Get Me Some) at the merch table that night. Love is the Answer is still one of my favorite Jeff Healey songs to this day.